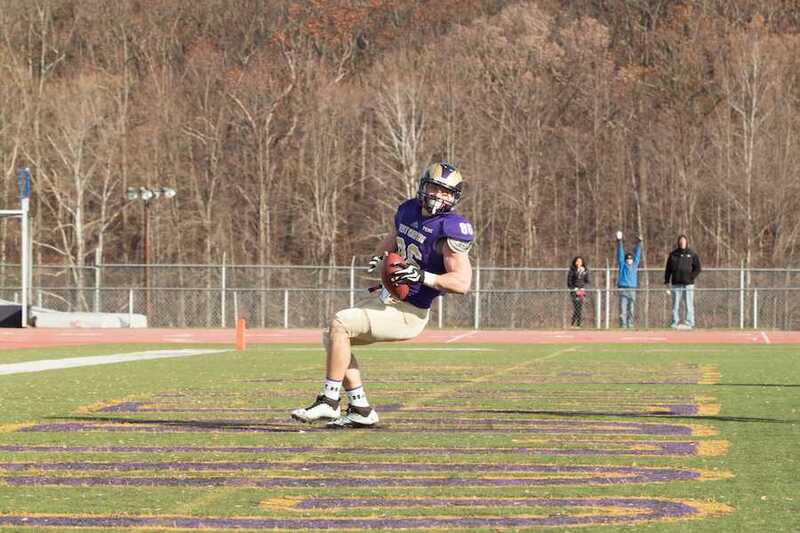 The West Chester University Golden Rams football team was firing on all cylinders Saturday afternoon in a 46-20 defeat of Slippery Rock University in the first round of the NCAA division II playoffs. For senior quarterback Sean McCartney, the next few weeks are a chance to seal his name in the West Chester record books as one of the best quarterbacks to suit up in the purple and gold. Saturday, McCartney did not miss his chance. Throwing for 405 yards and five touchdowns (23-40), McCartney carried the Rams to an early lead, which they never looked back from. All five of McCartney’s touchdown passes came in the first half. Sophomore quarterback Andrew Derr also stepped in and threw a touchdown on his only pass attempt of the day. With his huge day, McCartney is closing in on a milestone. Dave McDonald, who threw 40 touchdown passes in the year of 1994, for touchdown passes currently holds the single-season record. Currently, McCartney sits at 39, still with at least one more game to play. Breaking this record would be another notch in the already extremely impressive career for the West Chester quarterback. The carries were shared evenly between the three Golden Rams running backs. Leading the way, Eddie Elliot topped all running backs with 14 carries for 55 yards and a score. Elliot, despite not seeing any carries last week, rose to the occasion and pounded the rock for West Chester. Close behind, Brandon Monk carried the ball 12 times, gaining 40 total yards on the ground. Jarel Elder, who has been a nice relief for the Rams out of the backfield, also carried the ball 11 times for 36 yards. Despite not totaling huge numbers out of the backfield on Saturday, the West Chester running game kept the Slippery Rock defense on the edge all day, allowing the Golden Rams to get their passing game flowing. On the receiving end of McCartney’s big day, Tim Brown led the way for West Chester. Brown, who has been dominant and one of the most reliable receiving targets in the PSAC this year, caught seven passes for 164 yards and three touchdown scores. Brown, who leads all West Chester receivers with 15 touchdown catches on the season, added to his already impressive season resume with the huge day. The connection between the two has been a flame for this offense all season, but as of late, no opposing defense can put their fire out. Brown’s big day did not come easy; the hard work of his fellow receivers is what helped give him openings down field. Mike Doty had an excellent game, catching five passes for 108 yards and one score. Doty has been a go-to for McCartney, and extremely reliable all season. Five other players caught passes for the Golden Rams, none surpassing more then 50 yards receiving. On the defensive side of the ball, line backing duo Ronell Williams and Mike Labor were at it again. Labor supplied seven tackles, two of them being for a loss, while Williams added eight, two being sacks. Labor has been a dominant force for the past few weeks on defense, but seeing Williams turning up the fire as the second round of NCAA playoffs approaches is a great sign for Golden Rams fans. The two can both make a case for the spot as the best linebacker in the PSAC, but putting them together can turn the West Chester defense into one of the best in the country. The two were given the task of stopping Slippery Rock running back Shamar Greene, who has eclipsed the 1,000-yard mark this season. Greene was more then controlled, he was completely shut down. Mustering a total of only 23 yards on the day, along with being held to negative yards in the first half, Greene could not get anything going due to Labor, Williams, and the excellent West Chester defense. Andrew Cohen took this season by storm. Entering the season there were high expectations for the powerful defensive lineman from Council Rock South High School. Cohen has been everything the Rams have hoped for on the defensive line. Saturday, Cohen grabbed nine tackles, five for a loss, along with one and a half sacks. Alongside Cohen, fellow defensive lineman Shaquil Ryder totaled seven tackles on the game. The stingy defensive line of the Rams has been great in the past few weeks, led by Cohen and Ryder. As the next game against Concord approaches, the Rams will need the killer instinct that the two have been providing so far this season. The Golden Rams will next travel to Concord University to take on the 11-0 Concord Mountain Lions. Concord, who is the top seed in Super Region 1, will look to quarterback Brian Novak who has thrown for nearly 3,000 yards and 30 touchdowns this season to lead them into battle. At Novak’s side, running back Calvinaugh Jones enters the game having rushed for 1,350 already this season. The quarterback-running back combination, much like the Rams’ combo of McCartney/Monk, will be fun to watch as they try to take on a flaming hot West Chester defense. Last season, a playoff run swept West Chester fans off their feet into what was one of the most exciting seasons of any Golden Rams sports teams in recent history. This year, with a huge game approaching on Saturday, perhaps West Chester will surprise the country with another dramatic playoff push and try to top last years success.